The Viticulture Practice: Home Page. European Viticulture Tour Part 1. A view of Barolo township with vineyards on the south facing slopes, inderspersed with forest and hazelnut groves. 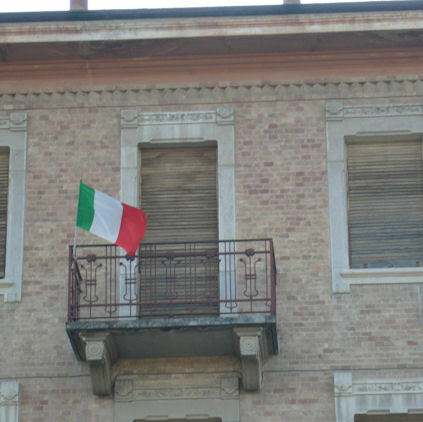 As its name implies the region of Piemonte (Piedemont) is at the foot of the Italian Alps. Grapes are grown through out the region but the the best wines come from the Denominazione di Origine Controllata Guarantee (DOCG) of Barolo, Barbaresco and Asti and the DOC region of Roero; all located in the South West near the valley of the Tanaro River. Nebbiolo is grown in Barbaresco and Barolo, producing impressive red wines with concentrated fruit and a tannic backbone that means the best of them are unaproachable before 10 years of bottle age. Both regions have hot summers and long cool autumns which aid in ripening the all important tannins. Arched cane pruned Arneis vines on a hillside in the Roero. Note the individual stakes for each vine and the minimalist trellis system. East-West rows minimise erosion. Soils in Barolo and Barbaresco are a combination of calcareous marls and sandstone.The Langhe hills of Barbaresco rise from 150m to 350m. Barolo is higher and cooler and is considered to make the better wine. 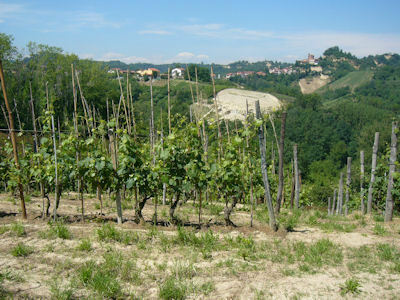 Barbera, another red variety that produces a lighter,early drinking style wine is also grown throughout the region. 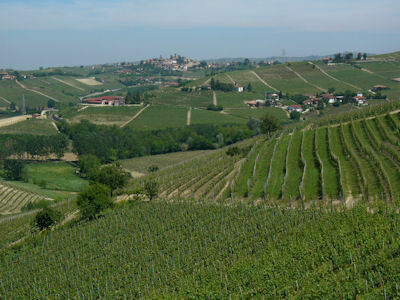 The sub region of Asti is renown for its fruity sparkly wine. 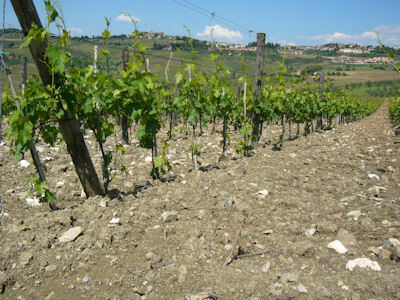 The best examples of the white variety Arneis are grown in the Roero in the sandy soils on the North West bank of the Tanaro. The wine is fermented in stainless steel tanks at an optimum temperature of 20-22 degrees C.
South facing slopes capture the sunlight. Usual vine spacing is 0.7m X 2.2m with the fruiting wire at 700mm or 800mm. Most common training system is bi-lateral V S P.
Angelo Gaja introduced modern winemaking practices to the commune of Barbaresco and was influential in establishing Barbaresco as a quality wine region. 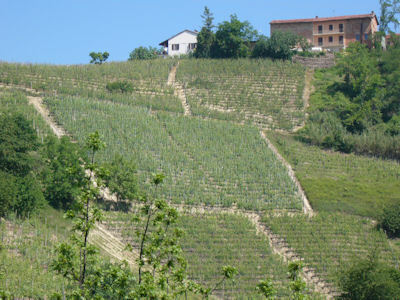 Vineyards in Chianti are usually cultivated. 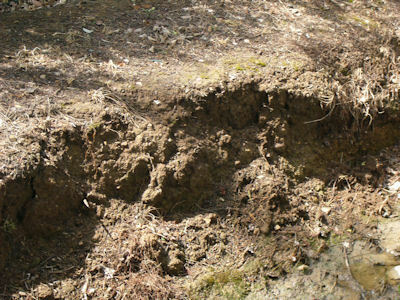 Soils are calcareous marls with varying ammounts of sand and weathered gravels and bed rock. Chianti is the most well known of all the Tuscan wine regions.The red wines Chianti and Chianti Classico Riserva are both made with the Sangiovese grape, however the white variety Trebbiano and the lesser red grape Canaiolo may be included in the blend- especiallty in the early drinking Chianti. Neigboring region Montalcino produces the well regarded Brunello di Montacino, also made from the Sangiovese grape.In the sandy soils at San Gimignano to the west, the white variety Vernaccia is grown, producing a spicy fruity wine that is becoming inceasingly well known. At Vignano the winery is in a 600 year old cellar. 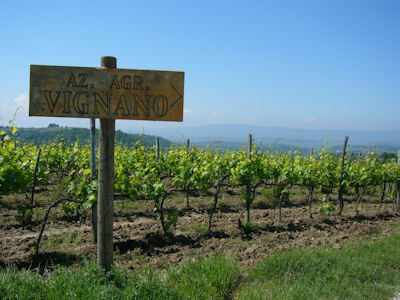 Azienda Agricola Vignano is an organic winery and vineyard in Chianti Classico owned by Swiss couple Walter and Natalie Fromm. Sangiovese, Merlot and Malvasia Nero are planted. The use of French varieties provides options to market the wines as modern in the "super Tuscan" style. Older plantings are spur pruned and recent plantings are VSP. Vines are trained up an individual pole of reinforcing steel. Yields are restricted by shoot thinning to 6 shoots/vine. 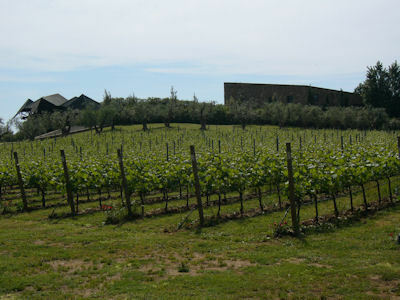 Vineyard at Sassicia in Bolgheri. This commune on the Tuscan coast is the home of the "Super Tuscans"; red wines that are blends of Sangiovese and Bordeaux varieties, Cabernet sauvignon, Cabernet franc and Merlot. These French varieties thrive in Bolgheri's maritime climate and the iron rich clay-loams found in the region. The first planting of Cabernet by Marchese Inscisa della Rochetta was at Sassicaia in the 1940's. the Sassicia brand now has an international reputation and is marketed by Antinori. 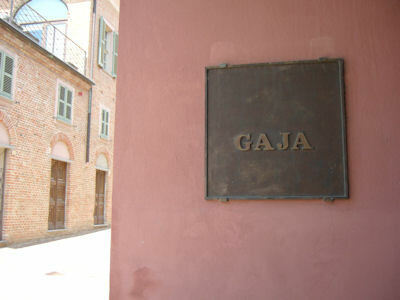 Other producers such as Ornellaia and Gaja have followed. Terre brune is the local name for the iron rich clay loam of the Bolgheri region. Terraced vineyards in the Wachau. The premium wine regions of Wachau, Kremstal and Kamptal are located on the North bank of the Danube, south east from Vienna. The main grape variety grown is Gruner Veltliner, Austria's signature variety. Riesling is grown on the steeper slopes and Weissburgunder (Pinot blanc) is also grown. Sandy loam soils on the lower slopes are suited for Gruner Veltliner while, higher up, the less fertile soils from gneiss and granite parent material are conducive to Riesling. Extremes of climate due to East Austria's continental location are mittigated by the presence of the Danube and the warm air flow from the Pannonian plain in neighboring Hungary. Rainfall is low (660mm/annum). Close planting is standard. Irrigation is required. A line up of the best Gruner Veltliners from Kamptal. All three regions have upgraded their viticulture standards since the ethylene glycol scandal of 1985; each now has its own appelation system to identify the highest quality wines. Yields for G veltliner are kept below 9t/Ha. A vineyard near Mistelbach in the Weinviertel. Note the inter-row cover crop of oats and the high fruiting wire due to high incidence of spring frosts. Wienviertel (wine quarter) is where the bulk of Austria's winegrapes are grown. Gruner Veltiner again is predominant and production is classified into two appelations: DAC which is unoaked and has the characteristic spice and pepper (peffrig) of the variety and DAC Reserve which may have oak ageing and also botrytis characteristics.The red grape Zweigelt is also grown on warmer, more sheltered sites. Climate is continental with hot summers and cold winters. Spring frost is a problem. Wine production is mostly by small producers where the grapegrower is often also the winemaker. 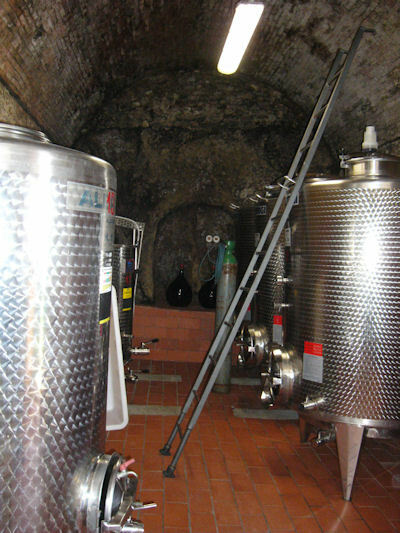 Many villages have networks of underground wineries and wine cellars known as Keller gassen. A row of wineries in a lane on the outskirts of the village of Kronberg. There is a network of cellars underneath. The cellars may be several hundred years old but the technology is up-to-date. With the exception of the Bolgheri region, all the premium wine was grown on hillsides facing the equator. In the smaller producers that were visited the role of winegrower and winemaker and marketer is often combined, leaving large winemakers and brands out of the supply chain. All the wine producers visited were able to sell all that they produced. All regions visited had some form of appellation in place to ensure consistent quality and to protect the regional brand. High density plantings mean smaller canopies and less need for large and expensive trellis systems. Anon. (2011). Austrian Wine-A Taste of Culture on www.austrianwine.com. Retrieved 20/08/2011. Anon. (2007). Tu Lange Roero. Ente Turismo, Alta bra Langhe, Roero. Groelle, C., (1990). Vins de France. I’Alsace. Opeasi poche. Lucerne. Jackson, R. L.,(2002). Wine Science. Academic Press. San Diego. Johnson, H and Robinson, J. (2005). World Atlas of Wine. 5th Ed. Mitchell Beazley. London. European Viticulture Tour: Part 1.